Passion and commitment are the main characteristics of a strong music educator. Studying and practicing how to teach, and what methods are best to use, is only half the job. The component that makes it worthwhile and enjoyable is the passion that the teacher has behind it, and how hard they are willing to work to ensure that students are fully educated while still enjoying what they are learning. 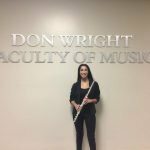 As a third-year music education student at the University of Western Ontario, Pamina Neote has been given many opportunities to work in the education field. Studying flute, Pamina taught as the flute section leader/instructor for the 2016 Laurier Elementary Honour Band and the front desk co-ordinator for the Western Intermediate Honour Band, working very closely with music educators and professors like Dr. Jessica Kun (Laurier) and Dr. Colleen Richardson (Western) whom she currently studies with. Prior to her exposure in education at university, she worked very closely with schools in and around her area to volunteer and teach when she could in music classrooms. Pamina possesses characteristics that she has adopted from her previous and current educators throughout her schooling; patience, positivity, support and passion have all aided her in teaching in various settings and helped her gain experience to fully understand the demands of the education field. She is constantly striving to find new alternatives to teach a concept to someone and is ready to remediate any problems that may arise in the lesson setting to help the student push past the obstacle that they are facing. Pamina enjoys the field of education and cannot wait to teach music in her own classroom someday, supporting and educating others who enjoy the same benefits that music can produce, is what pushes her to continue to teach students and make music. She hopes that you will enjoy her lessons as much as she enjoys teaching them!